With more than 30,000 locations operating today, the United States Postal Service is still the largest retail network in the US. It's also an embattled institution that's struggling to stay afloat. That's why last year, it enlisted a small design studio to overhaul its look completely. Here's what they came up with. Over the last several years, USPS has lost billions of dollars a year and struggled to find footing in a world that's long since gone paperless. From ending Saturday deliveries to even more radical proposals aimed at cutting costs, the agency seems willing to consider just about anything to save itself. Including a complete overhaul of how it looks. That might not sound very extreme, but it's arguably just as important as, say, cutting back deliveries. Why? 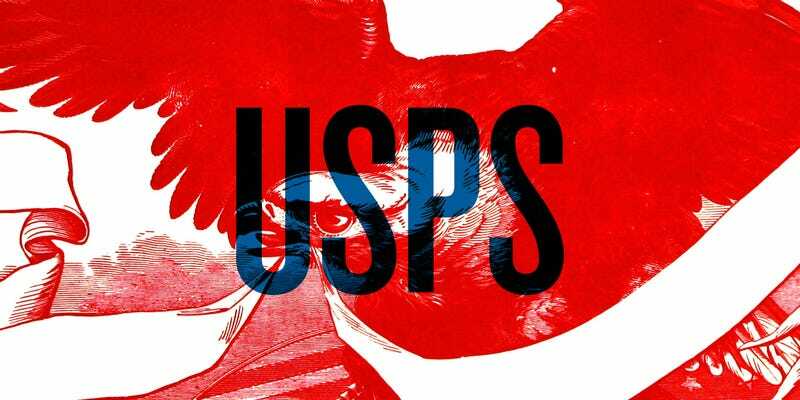 Because the way the USPS is perceived—as a crumbling, slow, often unreliable and usually inconvenient dinosaur—has a massively negative effect on potential customers. It's not like people don't still need physical mail. But convincing people choose USPS over FedEx or UPS is a battle that the carrier desperately needs to win. It remained seemingly anonymous until this week, when the fantastic branding blog Brand New posted a look at the full redesign. It turns out that the revamp was the work of a small, three-person design firm in New York called GrandArmy, which spent three months completely reinventing the USPS, from its boxes to its actual retail presence. I got in touch with the studio to find out more. So, how long does it take to reinvent a behemoth such as USPS? As GrandArmy's Eric Collins told me, the whole process took roughly four months of intense work by the three members of the team, along with regular input from the USPS. The system they developed is rooted in the golden era of the post office, appealing to patriotism without seeming overtly nostalgic. For example, there's a beautiful crosshatched poster showing a Pony Express rider and a burst of text separated by a lightning bolt: YOUR MESSAGE, OUR MISSION. The entire system hangs on signage—and legibility. The standards GrandArmy developed are a clear and concise use of the typeface Gotham that never seems overly stylized, while pinstripes and a strict grid system make it easier to read from all the way back at the end of the line. Even so, Collins says the process of working with a huge agency like USPS was surprisingly smooth. "We were very happy because everyone as USPS got on board and believed in the project," he adds. "It's almost the last thing you'd expect, you'd expect unmanageable bureaucracy, that really wasn't our experience. They were great to deal with." A few days ago, I was at my local USPS, hoping to send a package and at the very end of the line. It was a frustrating situation I'd been in a million times. And while it didn't help speed things up, I noticed that I could actually read the signs behind the counter. The store looked a little less like a grim, a little less fluorescent, and a little more colorful. A few days later, after reading about the project on Brand New, it clicked: I must have noticed the new branding. USPS is still in trouble, but the customer experience is improving thanks to projects like this one. A great retail design can't fix everything, but it can go a long way towards greasing the squeaky wheels of a very big, very complicated machine like the USPS.